Before giving up, think twice. No, Think again! What if I was at the edge of attaining success? Yes, life is hard, every one chorus that but giving up is not an option! This Iranian young lady never used her current situation as an excuse, she fought and she’s a warrior. Excuses are never a way to get out the hardships of life! If a person can be successful regardless of his/her pain and struggles, he is a real warrior! Of course, life will not offer us a plate full of gold, we just have to take it by force and the disabled Iranian artist Fateme Hamami took it by force! It is very interesting to know that Fateme is a football fan and has previously painted Iranian football legend Ali Daie, who personally paid her a surprise visit in appreciation of the image she painted of him. 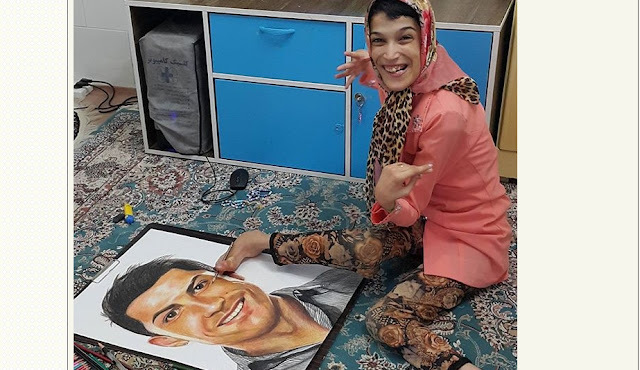 Fateme’s current painting of Cristiano Ronaldo, the football legend many looks upon, has gone viral as she posted it on her Instagram account! People like Fateme are really an epitome of inspiration to those thinking giving up is their last option in life.